Only two months removed from a fire that was thought to have seriously damaged the venue, Rio's Velodrome in Olympic Park has been confirmed as the site for the 2018 Para-cycling Track World Championships. 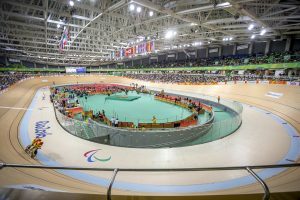 RIO DE JANEIRO, BRAZIL – Sports cycling’s world governing body, the International Cycling Union (UCI), has just announced that the recently fire-damaged Velodrome in Olympic Park in Barra da Tijuca will be the site of the 2018 Para-cycling Track World Championships. Rio’s Velodrome in Olympic Park will be the site of the 2018 Para-cycling Track World Championships, the first major world championship event scheduled to take place in Rio since the Rio 2016 Games, photo courtesy of Brazil Ministry of Sports. The competition is the first major world championship event scheduled to take place in the Cidade Maravilhosa since the Rio 2016 Olympic Games and Paralympic Games one year ago. “The Rio Olympic Velodrome has the ideal conditions to host any international competition. We have been anxiously waiting for the news [announcing Rio as host city],” exclaimed Jose Luiz Vasconcellos, president of he Brazilian Cycling Federation (CBC). The UCI’s announcement comes at a crucial time for Rio as the city remains bogged down amidst Brazil’s political scandals, the city’s rising levels of violence, and concern over the legacy of the Rio 2016 Games. 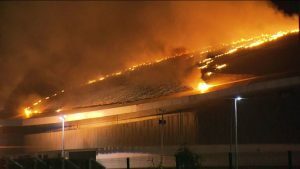 In addition, just this past July, the Velodrome was thought to be seriously damaged when the venue’s roof caught fire after having been struck by a homemade hot air balloon. However, following the UCI’s announcement, former UCI-president Brian Cookson asserted, in an interview with the website, insidethegames, that the damage to the Velodrome was not as bad as initially reported. It took Rio fire fighters several hours to fully extinguish the blaze at the Velodrome in July, photo internet reproduction. Importantly, according to Cookson, Brazilian authorities have informed the UCI that repairs to damaged areas from the recent fire will soon be completed. “We are assured by the Brazilian Government that the repairs to the roof will be completed in the next couple of weeks,” said Cookson. The Velodrome hosted track cycling events during both the Rio Olympic and Paralympic Games. Its track, considered one of the fastest in the world, was built with a special pine wood found only in Siberia. Following the Games, the venue was rarely used and only hosted its first post-Olympic event this past May, the three-day bike festival, Rio Bike Fest.